Let’s move onto something a bit more bearable, shall we? I like cinnamon apples. My mother in law makes some with diet Coke and something else, they are really yummy. This recipe does not sound remotely like a diet dish, which the diet Coke one is, and it also sounds like it may be more spicy being as it uses those red cinnamon candies. When I was growing up we had the sweetest dog named Lucy. She ate everything. Except, once I gave her a few red hots and she snapped them right up, and then spit them right out. :-) I don’t recognize this handwriting as Gram’s. Also, it seems as though Gram wrote in after the fact 1/2 # for the amount of red cinnamon candies, but that seems like an awful lot! Pare and core firm apples. Boil apples in syrup. Lucy was no ones fool when it came to stuff she didn’t like. And that was not a lot. She was the best dog. She could jump up and see into the pan on the stove. She looked like a yo-yo doing it. Spring board legs on that one. Ah, I remember Lucy. She was the best dog. I am wondering if the notation for the candies as supposed to be 1/2 the amount listed so only a 1/4 cup. I am not a fan of those cinnamon red hots so I’d be leary of a 1/2 pound. Maybe it’s actually a note that both the water and candies are 1/2 cup. that might be the case since the original writing covers 2 lines…but what’s that other little one doing sneaking in? Errant mark on the page? Diane I think it really calls for 1 cup of the red hots, yikes! Maybe her note really does indicate to halve the amount and use 1/2 cup. Seems with a cup of sugar the whole sauce should be sweeter rather than so strong. I may try this soon just to know. 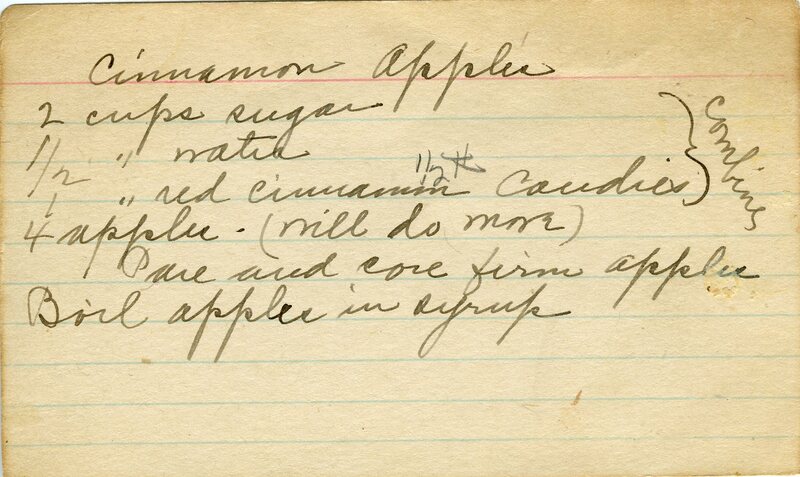 The writing on this recipe looks like MY grandmother’s – Grandma Sternberg (Alice). Perhaps one cup of red hots was 1 pound, and 1/2 pound would be the 1/2 cup you want. They are pretty dense you know.